(Al Hartmann | The Salt Lake Tribune) Chad Smith, of West Valley City, looks at redistricting maps on Sept. 27, 2011. A citizen initiative seeking to end gerrymandering in Utah held a precariously thin lead Tuesday night. Proposition 4 led 50.3 to 49.7percent in partial unofficial returns, as of 7 a.m. Wednesday. That lead is small enough that late arriving by-mail ballots could shift it as the vote count continues in coming days. Prop 4 would create an independent commission appointed by the governor and legislative leaders to draw Utah’s congressional and legislative district boundaries after the census every 10 years. The Legislature could reject its recommendations, but would need to explain why to perhaps angry voters. The bipartisan Better Boundaries group gathered 150,000 verified signatures to put the issue on the ballot, arguing that voters should pick their politicians — and that politicians should not pick their voters. 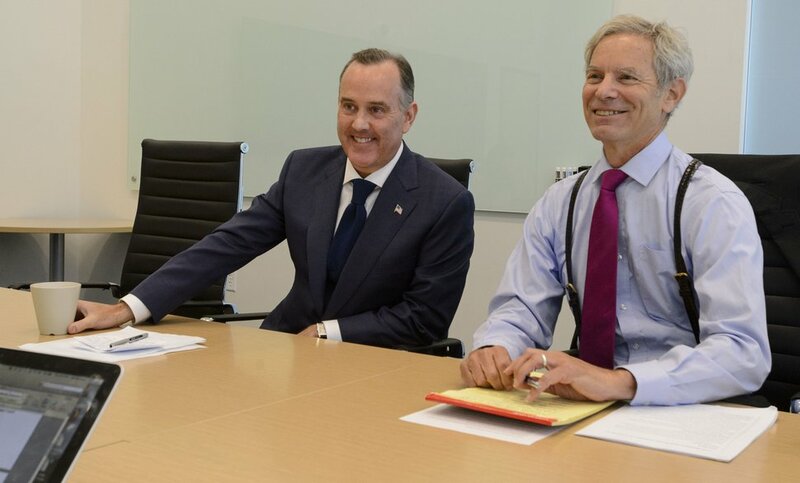 Steve Griffin | The Salt Lake Tribune Former Salt Lake City Mayor Ralph Becker, right, and Jeff Wright talk about the formal launch of the Better Boundaries initiative at the Cicero Group offices in Salt Lake City, Thursday, July 20, 2017. Wright, a Republican, said early ads featuring video of the late President Ronald Reagan urging creation of such independent commissions — helped to convince Utah Republicans the idea is sound, even though local Democrats long accused the Utah GOP of shaping boundaries to their advantage here. GOP leaders of the Utah Legislature opposed Prop 4, arguing that the Utah Constitution gives lawmakers sole responsibility to redraw districts. They charged that Prop 4 was mostly an attempt to create a safe Democratic congressional seat in Salt Lake County (where the GOP Legislature had diluted the Democratic vote by dividing it among three mostly Republican districts). Prop 4 was winning early Wednesday only in coutnies with large numbers of Democrats: Salt Lake, Carbon, Grand and Summit. Better Boundaries got 69 percent of the $1.9 million it raised from out of state, and many of its largest donations came from Democrats or left-leaning groups. That included nearly $1 million from the Action Now Initiative, an advocacy group founded by Democratic Texas billionaires John and Laura Arnold. Prop 4 arose amid persistent allegations of gerrymandering by the Republican-controlled Legislature. For example, after the last redrawing in 2011, then-Democratic Rep. Jim Matheson accused GOP legislators of splitting up his old district three ways to make re-election impossible in the district where he lives, so he chose to run in an adjacent one that included more of his former constituents. With the unusual move, Matheson barely won re-election — by 768 votes — over challenger Mia Love in 2012. Two years, later, he chose not to seek re-election, and Love then won the seat.